Kori Ruth has always been drawn to movement and exercise, whether it's dancing, running, HIIT training, etc, there is nothing that she won't try. Her first love is yoga, which she graduated as a 200-Hour RYT (Registered Yoga Teacher) in 2013. Since graduation, she hit the ground running as a teacher, spreading her love for yoga across Greater Cincinnati. Her passion has taken her to New York City to study Strala Yoga with Tara Stiles, Indianapolis and Louisville to study with the Power Yoga pioneer, Bryan Kest. To date, Kori has taught over 1000 classes, which qualifies her as an Experienced-Registered Yoga Teacher (E-RYT). 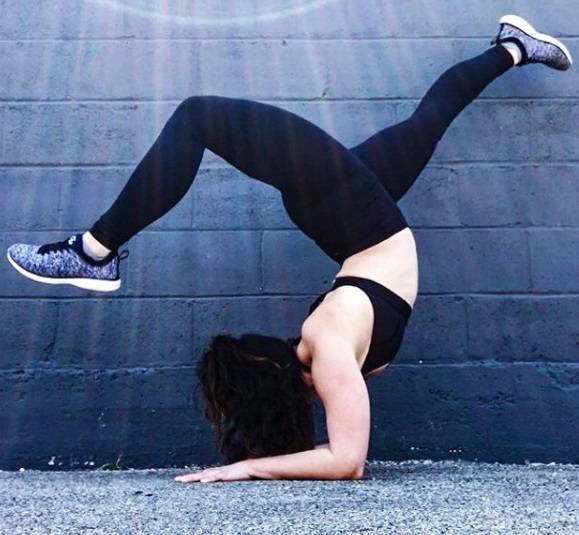 In the years since graduating, Kori has taken the classic foundation of yoga and given it a contemporary twist. Students can expect to leave Kori's classes feeling open, stretched, strong, and restored from top to bottom and inside out. Okay so this one is weird, but without a doubt I am the best at finding solutions and answers to problems. No matter the task, I will go out of my way to provide an answer. Whether it is finding a good yoga studio to visit while traveling, new workout (or really any kind) clothes, a lost diamond earring on a studio floor, a gluten-free recipe for cinnamon rolls.. Once I even tracked down my friends father who she had never met (okay, I know that one sounds extreme) but, honestly I will find anything. I really just love to help people look for things that they thought where gone forever. I think maybe it's the challenge and satisfaction of finding the impossible. My personality. It's what makes me me! A long time ago I made a choice to live as optimistically as I can, (Of course, I have slip-ups) but as a rule I try to look at everything with the glass half-full. It is because of my desire to live life positively, that I am typically the loudest, silliest, most outgoing person in the room. I think that because I embrace all of these aspects of my life, I am able to live my life as my true self and that is what makes me the best version of myself. I live my truth. Personally, I would like to not only continue to further my personal yoga practice physically but mentally as well. I want more meditation, more breath, more awareness, more stillness, more movement, more life. As far as business goals, I want to reach more people. Sometimes you can hear something in a yoga class 100 times by 100 different people and then one day it's just different and you finally get it. I want to give people yoga who otherwise would not get it. What a difficult question! My biggest success would be teaching Mindful Yoga Therapy (including skills such as yoga & mindfulness) to youth in my local Juvenile Justice system. It is by far the most rewarding thing that I have ever done and I am extremely proud & honored to have opportunities like this. The most challenging moment was leaving a job at a yoga studio that I had been at for many years, to work for myself. I had so many students that I made real connections with and it was really hard to say goodbye to them. Ultimately it came down to a question of values, morals, and ethics, and looking back it was the best decision I have ever made. Life is full of possibilities and your life can change at any single moment. My mom is my role model. She is the pinnacle of resiliency and strength for me. I go to her if I have a problem or need advice. I know she has my back. As far as business inspiration, I look to Talia Sutra as a yoga teacher - her flexibility and grace is so inspiring. Tara Stiles of Strala Yoga is also at the top of my list. I took her training in NYC in 2016 and she was incredible. My favorite product is definitely my signing bowl that was given to me as a gift. It’s a beautiful piece and I cherish it deeply. I also really love all of my beads, however there is one mala that is very special to me. I got it while I was at a yoga retreat, and it just brings back great memories.